When people are talking about outsourcing, usually they are talking from the cost reduction perspective. Especially this is important for the startups with limited, low or no cash flow. It’s true since the prices for the software development can be drastically reduced with IT outsourcing e.g. to Ukraine. 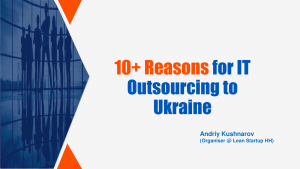 But this is only one out from 10+ advantage of the outsourcing to Ukraine! Andriy Kushnarov (founder of AK-IT Consulting) has more than 15 years experience in Software Outsourcing. Worked on different positions and knows very good how IT Outsourcing works. Also Andriy is originally from Ukraine. 7. 1 Area: 603 628 KM2 (DE: 357 168 KM2) UKRAINE 4 Timezone: EEST (UTC+2) 3 Capital: Kiev 2 Population: 42.4M (DE: 82.8M). 8. Quiz: Who are these Ukrainians? 25. FAQ: Is it safe in Ukraine?